Mindpool Technologies is engaged in the business of providing Oracle Consultancy Services, IT staffing and solutions and Corporate Training Services. Company caters to various industries including viz. banking and financial services, automotive and engineering, telecom, healthcare, Retail and Entertainment in India and US. Company’s key clients include Herbalife International India Private Ltd, Clairvoyant India Private Limited, Inspirage Software Consulting Private Limited, HTC Global Services (India) Private Ltd and Opalforce INC etc. Company provides extensive services in Oracle EBS, Oracle SCM and Oracle SOA covering upgrade & support solutions. Company’s services include advising, building, implementing, managing and supporting Oracle solutions and operating Oracle systems for clients. Company’s services include manpower recruitment and outsourcing for clients, comprising permanent staffing solutions and flexi staffing solutions. Company provides training programs to assist the employees of the clients in building their IT skillsets, to improve their technological knowledge, enhance their soft skills etc. Mindpool Technologies has a Registered Office in Pune and Corporate office in Bangalore. Company also has presence in USA through a subsidiary company (Mindpool Technologies INC., USA), which gives an international presence aiding in servicing clients in various parts of the globe. Part of Oracle Partner Network. Mindpool Technologies has Silver Level membership of Oracle Partner Network which is valid till March 14, 2019 subject to renewal. With this Company serves Oracle Solutions by providing customized Oracle Services to their corporate clients using Oracle software. 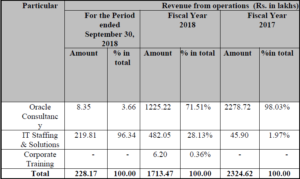 The revenue from oracle consultancy service was Rs.12.25 crores for fiscal year ended March 31, 2018. To Meet Working Capital Requirements. Repayment of a portion of Bank Borrowings. There are no listed companies which are operating in all the business segments as Mindpool Technologies Ltd. Hence we cannot make any Comparison. Also Read: Find the Complete List of Upcoming SME IPO in 2019. Elphinstone Road Mumbai-400 013, India.